A partnership which began with a single story-based weekend in March 2011 has blossomed into a series popular annual events, including this weekend’s BOOFest – a celebration of stories told around a blazing autumnal fire featuring a gathering of virtual story presenters at their spooky and scary best Sunday, October 19 from 10am to 3:30pm, SLT. All the performers are volunteers and the sessions are free to all Second Life residents, with tips this year benefiting The Lavender Field’s resident charity: Live and Learn in Kenya’s “Feed a Smile” program. 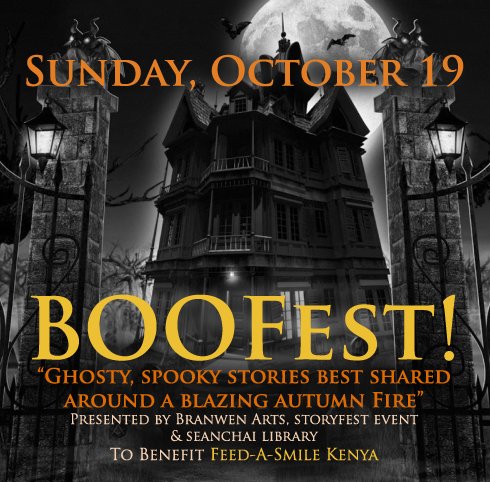 BOOFest features a wide range of stories within the broad genre of “spooky.” Story sessions will include everything from classic selections of authors such as Bram Stoker and H.P. Lovecraft; to works from more contemporary authors such as Neil Gaiman; and will also include original works by SL authors Freda Frostbite, Dubhna Rhiadra, Caledonia Skytower, and Moon Aerandir. Specifics on each performer, session, along with schedule updates will be available on the StoryFest Events Blogsite Friday evening, October 17th. All BOOFest presentations will be live in voice. Sunday’s event will be preceded on Saturday by an afternoon of musical delights produced by BOOFest partner, Branwen Arts. 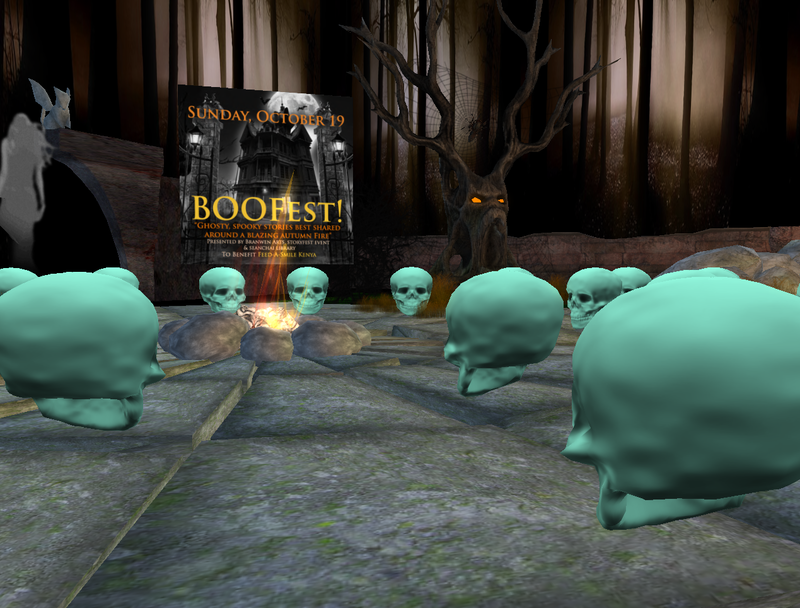 BOOStock will feature ghostly entertainments October 18th from 2-5pm SLT on their home sim of Bran. Featured acts will include Songbird Sorbet – the tiny opera singer, and The Frankentinies. If haunting on the grid gets a little intense for your pleasure, BOOStock is a great antidote for some spooky, silly fun. Both weekend events benefit Live and Learn in Kenya’s “Feed a Smile” which has been an active presence in Second Life since January 2010, currently resident in The Lavender Field. Desolation, hunger and thirst, poverty beyond comprehension, illiteracy, AIDS, child prostitution, and child rule the lives of the children living within the Rhonda Slums of Nakuru, Kenya. Live and Learn in Kenya is working to change this one day at a time, one child at a time. Live and Learn in Kenya works to enable education of needy children, including all the necessities required for an active, effective educational experience. They provide medical and dental care to all LLK-children, including check-ups and vaccinations. The "Feed a Smile" project is a great success, assuring nutritious warm lunches for over 400 children every day. All programs are run exclusively on donated funds, and L$100 will provide meals for a child in Kenya for an entire day. Seanchai Library (Shanna-key, which means "Storyteller" in Irish.) was born in March of 2008 as the West of Ireland Library and Cultural Center. Nearly seven years and thousands of story session later, Seanchai Library remains dedicated to promoting the power of stories to transform and inspire through live voice presentations in Second Life and on the Hypergrid, as well as promoting the work of a variety of charitable organizations every year. "We bring stories of all kinds to life, in virtual worlds." Contact Caledonia Skytower.